Rachel Von | The Journal Gazette Farrah Carney works on spreading mulch around a native tree that was planted Sunday during the Save Maumee Grassroots Organization's 12th Annual Earth Day Celebration at Heatherwood Park. Saying the Save Maumee Grassroots Organization got a good turnout for its 12th annual Earth Day Celebration is an understatement. With 550 trees planted each in Heatherwood Park and Moser Park, the three-day event marked the largest restoration project the group has undertaken. While about 50 to 60 volunteers participated Friday and Sunday, Saturday's session at Moser Park attracted more than 300 people, Save Maumee board member Jain Young said. She noted it coincided with the event Northeast Indiana Celebrates Science! at Moser Park Nature Center. Adding 1,100 trees should reduce nitrogen, phosphorus and sediment in the Trier Ditch subwatershed and help capture nearly 65,000 gallons of water annually, according to information distributed at the event. Save Maumee's efforts are supported by a federal Great Lakes Restoration Initiative grant administered through the Forest Service of the U.S. Department of Agriculture. Young said the federal agency is impressed by the organization's ability to attract volunteers. “If the regular citizens don't do it, it's not going to get done,” she said. Angela Rosalez of Paulding, Ohio, brought her 10-year-old nephew, Elijah Rosalez of Fort Wayne, to Sunday's planting at Heatherwood Park. Rosalez said she knew she had to help somehow. She wants to protect the Earth for younger generations to enjoy, she said. Elijah, who carried a piece of trash he found, said the event was educational. “I learned about the river's ecosystem,” he said. Ellen Bauman of New Haven said many of the volunteers' children have grown up participating in Save Maumee events, which is important. “If we don't teach them, who will do it when we're gone?” she asked. Bauman described the work as rewarding. “I feel way better doing this than my paying job,” she said. 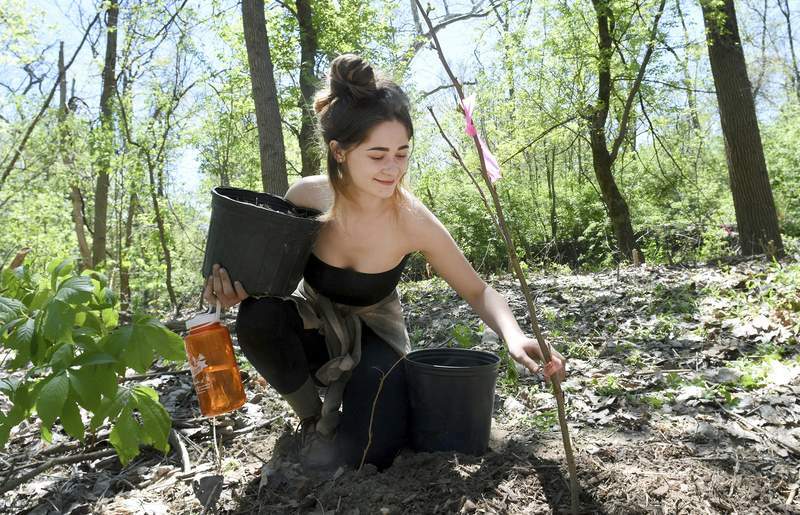 The newly planted trees – which included such species as river birch, shagbark hickory, sycamore and sassafras – were tagged so Frost-King can find and water them during droughts. She doesn't expect every tree will thrive. About 10 percent are expected to die, she said, citing a statistic from the USDA Forest Service. “It's not easy to get things to live where you want them to live,” Frost-King said. Save Maumee meets at 7 p.m. on the first Monday of the month at Don Hall's Gas House, 305 E. Superior St. Visit www.savemaumee.org for information.